For as much time as we spend building up to it, the 84th Annual Academy Awards are now quickly done and in the books. Let's do a quick wrap-up of the ceremony and wish all of last night's winners a hearty conDRAGulations! The theme of the night was "old time Hollywood," which made perfect sense given that the two films that racked up the most awards were about precisely that. Still, it seemed like an odd way to try and capture that young demographic they keep joking about. Perhaps after last year's majorly failed attempt to be young and hip made the Academy realize they are just a bunch of old, white men who should just embrace who they are? Something tells me that will never happen, but last night sure did appear to be a step in that direction. 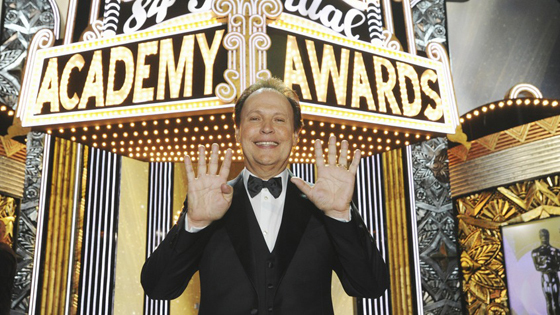 Billy Crystal was back and, for the most part, it was a welcome return. The opening bit with him appearing in various nominated films (and one oddly-included unnominated Mission Impossible: Ghost Protocol) was positively hilarious, as were his jabs at Kodak and constant references to his kiss with George Clooney. There were a few too many awkward jokes and pacing issues to call it an unequivocal success, but it was certainly "streets ahead" of Anne Hathaway and James Franco last year. Overall, the show was okay, if a bit forgettable. I wish they would've scrapped the Cirque du Soleil performance and allowed the two Original Song nominees to take the stage, and the consistent audio issues were embarrassing for a show of this kind of prestige. Emma Stone and the ladies of Bridesmaids were exceptional presenters, as were Sandra Bullock, Colin Firth and Natalie Portman. Not that I should be surprised, but none of my dream winners came out on top. The two major surprises—The Girl with the Dragon Tattoo winning Film Editing and Meryl Streep taking Best Actress—kept things interesting, as did the early onslaught of victories for Hugo, but the night generally proceeded as expected. Don't get me wrong, I am thrilled that Meryl finally has that elusive third Oscar, but when the "big surprise" of the night is a win for an actress who has been nominated 17 times, it's not exactly an unpredictable year for the Academy. That makes 16 out of 24 correct predictions for me. One less than last year, but not too shabby, I suppose. As predicted, there wasn't a sweep from any film, although with 5 wins each, The Artist and Hugo won more Oscars than any individual film last year. Jane Eyre, The Tree of Life and War Horse each got shut out of the one award I predicted for them, the most egregious snub being for Emmanuel Lubezski's stellar work on the cinematography for The Tree of Life. So, once again, condragulations to the winners and better luck next time to the also-rans. Remember, it's an honor just to be nominated, right? !